Spirit Island on Maligne Lake in Jasper National Park, Canada. The turquoise blue of the water is from the fine glacial silt in the water. 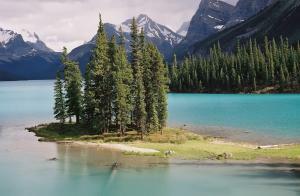 Maligne Lake is the second largest glacial lake in the world, I believe. Sorry to burst your bubble, but the img/link is broken. Thank you. Jasper is my favorite Canadian national park. I love the color of the water. Beautiful. It's a great location - recently visited as part of my honeymoon. It's a nice shot but some foreground interest would have made it even better - I have several shots taken from close to where the boat stops where there was quite a bit of foreground interest - did you happen to take anymore ? Thanks for the idea on including some foreground. I'll keep it in mind next time I visit the island. But when I was there I didn't see much of interest at water level, so I opted for an elevated view instead. I did take some more pictures, but in this particular image I wanted to draw the viewer's eye to the island and beautiful blue water. It was late in the day and very overcast. Fortunately for a few minutes the clouds opened up and bathed the island in the last few rays of daylight. From the image you can see the light is warm and is almost at a horizontal angle. It was one of those moments when everything came together. You achieved you objective - thanks for the congratulations, had a fantastic time in the Rockies, stunning place.